UXcamp Europe is an annual Berlin-based “unconference” in the style of a bar camp that centers around the emerging topics of User Experience (UX). In a field that is still relatively young and constantly developing, we wanted to find out about the emerging trends at this year’s camp. Having been involved in UXcamp over the last five years, we wanted to speak directly with the participants to find out what topics, problems and activities are most relevant in the field of UX. In the category “Hot Topics in UX”, Responsive Design emerged as the number one most relevant topic for the coming year, followed closely by Omni-/Multichannel UX and Mobile User Interfaces. This result does not come as much of a surprise, given the surge in the number of tablet and smartphone users. Companies are investing in mobile-optimized websites and apps while IT analyst Gartner is predicting that 50% of web sales will be generated via companies’ social presence and mobile apps. As more and more users are viewing websites on mobile devices, search engines like Google are also more likely to display your website prominently to mobile users if it is mobile-friendly. You can find out more information about the rise of Mobile in a presentation by Philipp. Closely related are Natural or Gestural Interfaces, which came in forth. The size and touch screens of mobile devices have opened up the interaction design space to entirely new possibilities of interacting with software, giving way to a more natural way of handling. Touching, wiping, rotating and other gestures are quickly replacing traditional point-and-click interactions. Yet, the UX community still seems to be looking for standards and best ways of making use of these new possibilities. Other topics, which also featured in some of the talks at this year’s UXcamp were Lean and Agile UX. In times of tight budgets, companies are apparently trying harder to find approaches that are more affordable and offer more flexibility. Simply put, Lean UX as well as Agile UX are about getting quick and dirty results early on in the design process to get user validation as quickly as possible and be aware of possible usability issues. You can learn more in a brief presentation on Lean UX I held a while ago. We asked those working in UX to let us know just how supportive their companies were of UX. While we were surprised (and happy) to find that more than half of the respondents thought their companies were “very supportive of UX”, there are still 40% whose employers remain only moderately or not supportive of UX at all. Given that the UXcamp by its nature drew mostly UX professionals who tend to work at companies that place importance on UX, there still seems to be considerable need for companies to catch up. Even with seemingly strong general support from employers, almost 50% reported that “integrating UX into the development process” remains their number one challenge in their everyday work. This shows that many organizations, despite having recognized a general need for UX, have not managed to find adequate ways to make UX a major part in their standard processes. A look at the second most important challenge reveals one particular aspect of this dilemma: Almost every second respondent reported that the processes of their organizations often do not allow them sufficient time to prototype solutions before critical design decisions are made. Despite the known cost and quality benefits offered by early-stage prototyping, companies appear to still save on the wrong end. Almost a third of the respondents reiterated “securing management support” as a major problem, making this the number three most important challenge UX professionals face within their organizations today. This is also reflected in the activities that respondents carry out. More than 80% of participants reported that “Coordination and Meetings” were activities they performed often or very often, making this the number one activity UX professionals spend time on. While UX is generally an interdisciplinary field where you cannot work in isolation, it is not hard to imagine that more time could be spent on other activities like prototyping if fewer meetings were required to obtain management support. Overall, it appears that employers of UXcamp attendees are at the forefront of UX, with 60% or respondents reporting high levels of management support for UX. Nevertheless, significant challenges still remain at an organizational level, which companies should look to tackle. UXcamp Europe is a great opportunity to exchange best practices and obtain insights into the challenges and topics mentioned above. If you want to hold a talk at a UXcamp near you, it looks like you would do well to compose a well-set out strategy for UXers to follow for resolving common communication and procedural issues. UXcamp is also a fantastic platform for talking about emerging UX trends, so it could be that Google Glass and Augmented attract people to your talk. Either way, we hope you have gotten some inspiration from this infographic and we hope to see you at a UX event near you. 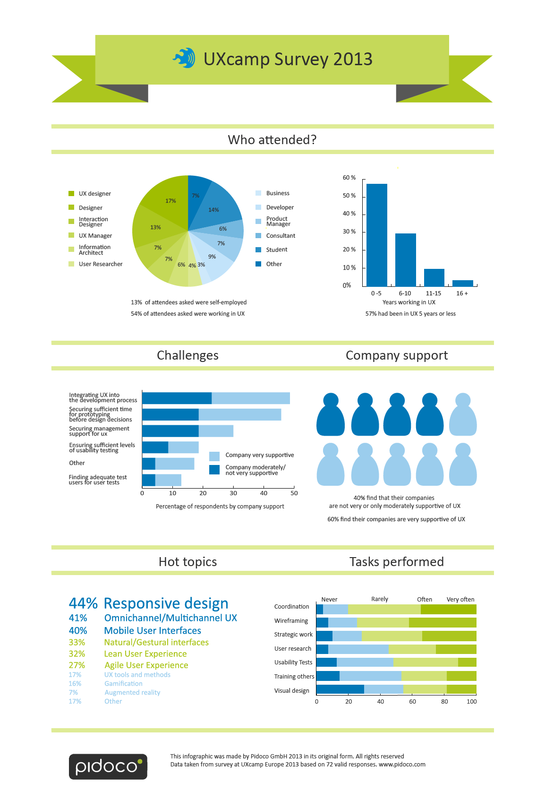 Thanks to everyone who answered our UXcamp survey this year! We would also appreciate if you have any links or advice for dealing with some of the top problem areas faced by our UXers. Have any of our findings surprised you? Let us know below.